Not to worry. If Mayor Pete keeps doing well, tRump will become the bigliest homophobe walking. No one will “outclass” tRump in any category of depravity; his malignant narcissism will take over... not that his personality disorder is ever in the off position. If Harris is the nominee, she will likely pick some safe, solid white guy as her running mate, for optical balance. Being a bi-racial woman is pushing the delicate sensibilities of white America far enough. You could imagine what Trump would do with his name. Archie Bunker Malapropisms galore. We need a word stronger than irony and hypocrisy. I am very impressed with the guy after hearing him. I was ready to write him off because of his being, you know, a millenial. I have tossed that around in my head a lot as well. Too much change at a point when this country is too fragile is a concern. But he seems to have a way. I went into watching his interview with that thought, walked away with a firm hmm... maybe. I have that same reservation even after seeing him in action. We have to win this election, and he will have trouble getting the votes of Blacks and Latinos if he made it to the general. Those are two communities that are behind the curve on LGBTQ acceptance, and we need their votes to win. I wish it were otherwise. Of course that probably means he can't win the primary too, so maybe it's a moot point. He'd be a good VP behind Harris though. Would love to see him go up against Pence in the debates. I am more afraid is he is a person with natural charisma as his sole asset. That is why he has to be looked into more deeply. We already have a charismatic in place and we know how that has worked out. I think it's more than the usual "likeability" aspect of charisma. He has a real talent for explaining complex topics in easily digested, everyday language. Sometimes a highly intelligent person will come across in a way that puts people off, and he doesn't do that. He's mastered the art of sounding like the proverbial guy you'd like to have a beer with, and not a Brainiac (which he obviously is). *I honestly do not see Pete boasting of "outsmarting" anyone. He doesn't have to. I agree. Truly intelligent people don't go around telling others how smart they are. Only truly stupid people like Trump go around telling others how smart they are. 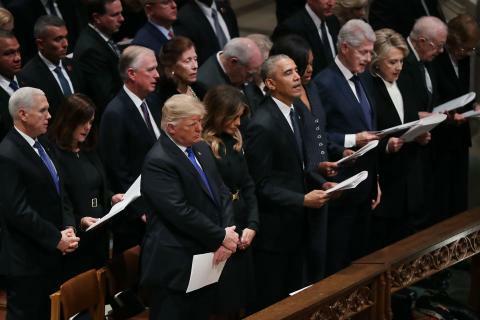 People actually believe Trump goes to church? Several times, even, over the years. There are pictures to prove it, at least as far as physical presence is concerned. Like this one. By the same standard, a cow can go to the Louvre, too. But all it would think of the Mona Lisa is that it didn't taste very good. Concur. We are all going to have to do our part. The Millennials have a person in Buttigieg who is closer to their own age. I am excited to see what happens with the effect that might have for youngsters. Really, I have no touch on that factor so it is a new thought in the mix. One thing I wonder about is the blue collar set and how they would receive him. I can hear my old shop now. But times have changed a lot. He'd be a good VP behind Harris though. He has a real talent for explaining complex topics in easily digested, everyday language. No argument. But my concern is that all he can do? I do not know enough yet to see if his works are as good as his image. That sounds cynical but is simply where I am at in this moment. Basically, he sounds great, I want to know more and intend to do the digging. For people who insist that they're using only the literal words of the Bible, they're leaving a whole lot out, and inventing a bunch of stuff that ain't actually in there, ain't they? Sola scriptura my Aunt Fanny. with the effect that might have for youngsters. You mean Bernie doesn't have the lock? Hillary Clinton knocked the Puppet down and out in the debates. Westboro Baptist or College Republicans? Yes, she did. Thank you. Buttigieg himself then addressed the hecklers. “You know, the good news is, the condition of my soul is in the hands of God, but the Iowa caucuses are up to you,” he quipped, pointing to his crowd. --this is a guy so secure in his faith that not only can he talk about it in complete comfort without it sounding forced, he can rebut those who try to use the Bible against him by telling them something they cannot refute. "Not everyone who says, 'Lord, Lord' . . ."
When Trump got elected, I resolved that my cat would outlast his term. She's 12. Lasting to 18 would be asking a lot. He's got to go! Not to nitpick but that's a funeral and it doesn't count.